I suppose I shouldn't have felt surprised to see that this year's BiciGo event is mostly about consumerism. After all, it costs a lot to rent space in Corferias, particularly with Christmas looming. A board to hang a bicycle against. But, for an event whose 'honored guests' came from Holland, land of the commuter cyclist, the emphasis might have been less materialistic. 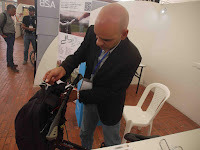 The Corferias hall was filled with shiny, hi-tech multi-million peso machines, which only a tiny percentage of Colombians could afford, and which nobody really needs. 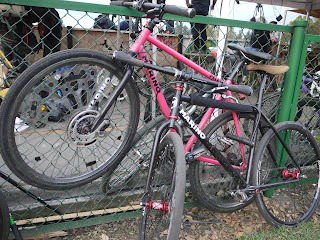 On my way out, I saw a Cannondale bike with a 26 million peso price tag (I won't say that it's worth that much). The asking price, of course, doesn't include the bodyguards you'd have to hire to be able to ride that bike down the street, or the insurance policy, or extra locks and alarm system for your house, or the sleep you'd lose worrying about getting robbed. In other words, that bike and many others are useless status symbols. Bikes with rain roofs look a bit like butterflies. But will they fly off in wind? BiciGo did have some more positive aspects, such as talks and discussions about bike commuting - which in Bogotá will never happen on 26-million peso machines - cycling in Holland and Colombia's Boyaca Department, the bicycle industry and others. 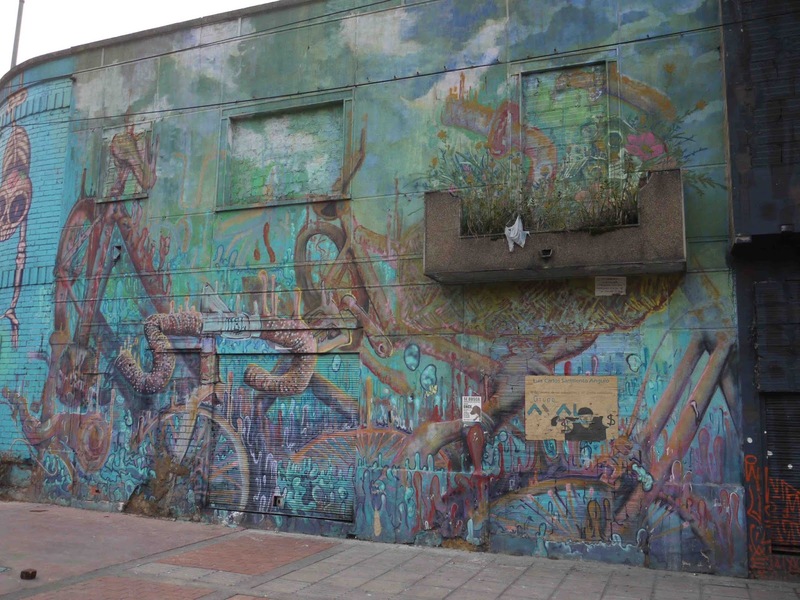 It also has bike repair workshops, which actually looked pretty good. 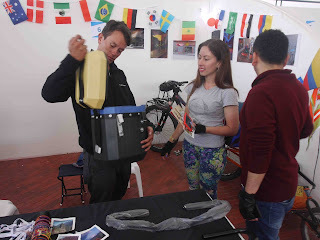 BiciGo also had riding lessons, a display of classic bicycles and some interesting products made by small local businesses, such as colorful bandanas, backpacks and even a sort of bicycle rain roof which made me worry that a gust of wind could turn it into a sail. 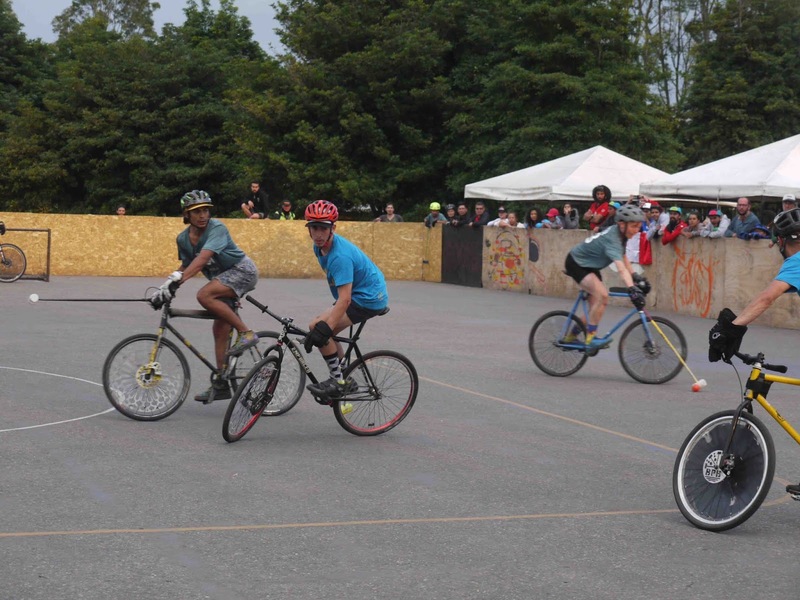 vehicles, whose only connection to the fair was their name: 'dirt bikes.' If cycling is supposed to be environmentally friendly, these vehicles are environmental disasters. Nobody I spoke to knew why they'd been invited. Perhaps a language issue, since the vendors were Asian. On my way to the fair I passed a bike lane that the rain and bad urban design had converted into a river. Leaving the fair, I passed a bicycle whose unwary owner had left locked to a street sign but returned to find that a thief had gotten to his bike first and stolen what he could and mutilated the rest. While I was contemplating that sad scene, a truck roared by belching a plume of smoke. It's nice to see bicycles and cycling getting attention and even throwing around some economic weight. However, it seems to me that Bogotá and Bogotanos can put resources to much better use for bicycling promotion than than spending thousands of dollars on trophy machines which are too expensive to use. Not nice for cycling. A rolling chimney rollas past. On my way to BiciGo I rode down this bike lane that was really a lake. Biks are wonderful - just now here! 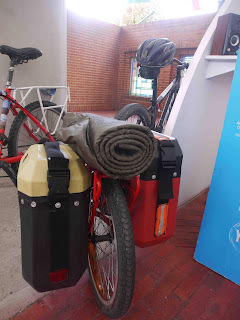 The Bogotá City Archive has this nice exhibition on now about the history of transit in Bogotá - prominently featuring bicycles! Wouldn't it be nice, then, if they actually welcomed cyclists to the building? Appearances deceive! No outsiders' bikes allowed here! But unfortunately, arrive by bike and the archive has noplace to park. They used to have a small, simple rack located near the entrance, within sight of the security guards. But now the rack is gone (perhaps because it looked unsightly). 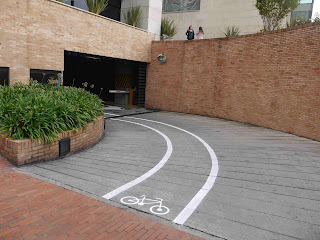 And altho the parking garage appears welcoming - with a bicycle and a lane painted in its entranceway, when I enquired the attendants told me that old archive employees can park there. That left me to park beside the nearby basketball court, which does have a rack. That was fine for me and my old clunker bicycle. But the surrounding Las Cruces neighborhood has a rep for drugs and crime, and so many cyclists wouldn't dare leave their bike on the street here. Once upon a time, there was a bike rack here. But archive 'improvements' removed it. I parked my bike by this futbolito court. But that was only because nobody wants to steal my bike. The nearby Claustro de San Agustin, a museum run by the bike-friendly National University, has nowhere to park bikes, either. The interior of the Claustro de San Agustin. No room to park a bicycle here? 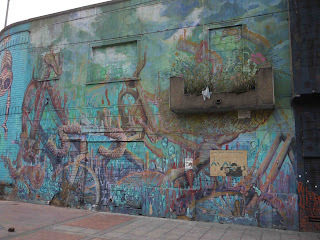 The Bogotá City Council now features this rather metallic Christmas tree laden with bicycles, which presumably will be given to lucky kids. But if the spirit is there, the reality is not always. Two blocks from the council's building is one of the city's most anti-cyclist, and anti-pedestrian crossings, which often forces us to stop and wait three times, for the greater convenience of drivers. I've complaind about this to council members and cycling activists, but nothing changes. A few blocks from the council's offices, cyclists wait at a light - perhaps the third time they've had to stop to cross the intersection. Intense action in the final game. 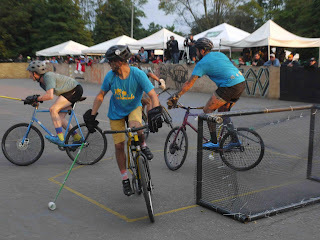 This weekend, 24 teams, mostly from Latin America, competed in a spirited bike polo tournament. A team composed of Colombians, Mexicans and a latino from North America won the tournament, but in reality these folks found their joy in the competition itself. Winning was secondary. 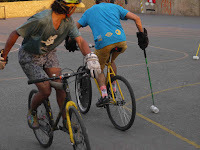 I also noticed that the distance from bike polo to anarchism isn't much. Bike polo bicycles waiting for action. Going, going, gone forever. Bicyces wait for their owner who never comes. 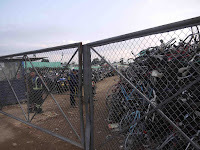 When the police sieze bicycles, either because the bike is allegedly stolen of a cyclist's infraction, the police store them in huge lots, until in theory the owner appears or pays his or her traffic fine. 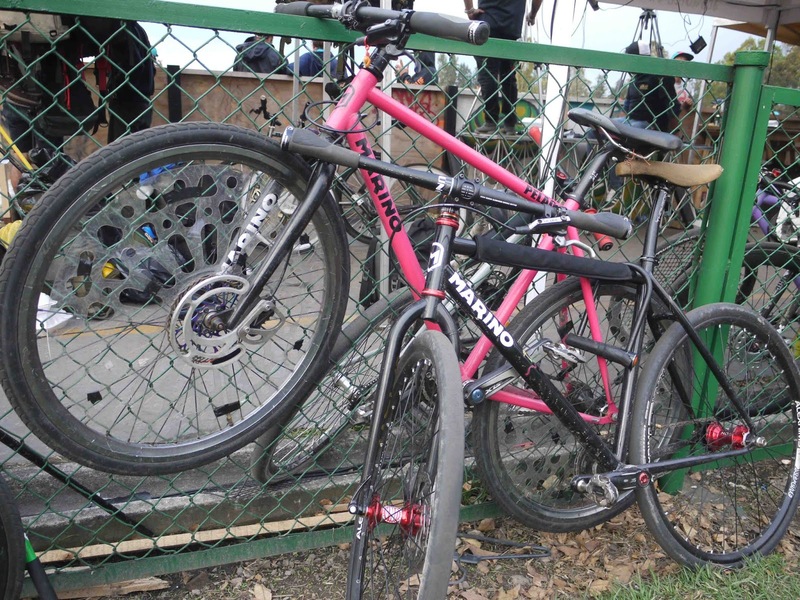 However, many of bicycle owners never do appear, and the bikes lie rusting away for years. For legalistic reasons - and undoubtedly authorities' apathy - giving the bicycles away is difficult. 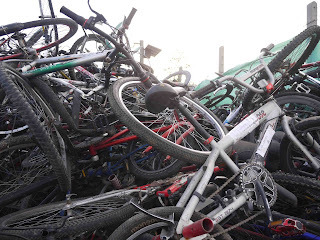 So, the bicycles accumulate by the many hundreds and thousands, slowly becoming worthless. 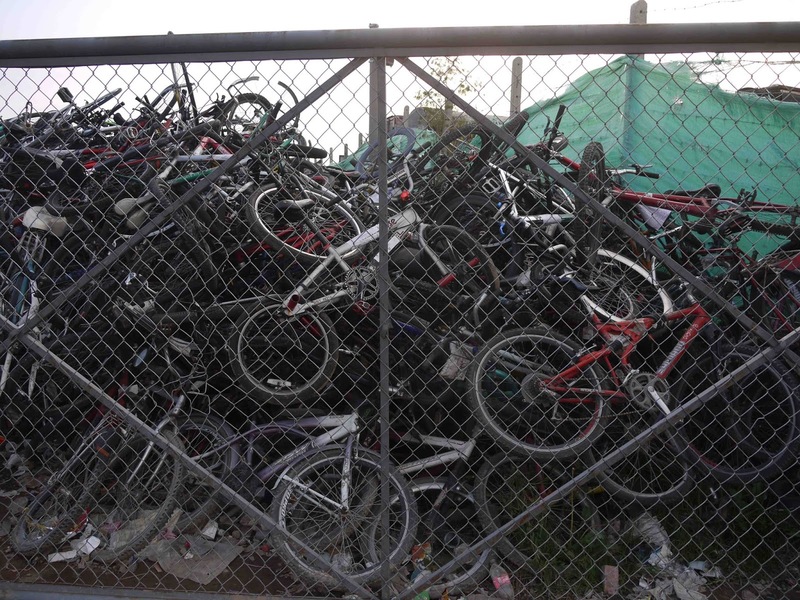 The other day, while pedaling to Parque La Florida to see a bike polo match, we passed one of these bicycle cemeteries, on Ave. Mutis, near Engativa. I stopped to snap some pictures, but when the security guards saw me they ordered me to stop. God forbid, after all, that anybody should learn about this problem. Then, someone might find a good use for the abandoned bikes, such as donating them to orphanages or poor communities, and the guards would lose their jobs. 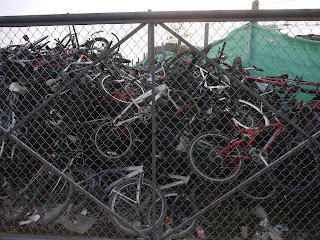 behind the Central Cemetery, portrays the bicycle cemetery. What's it Take to Go To Jail? 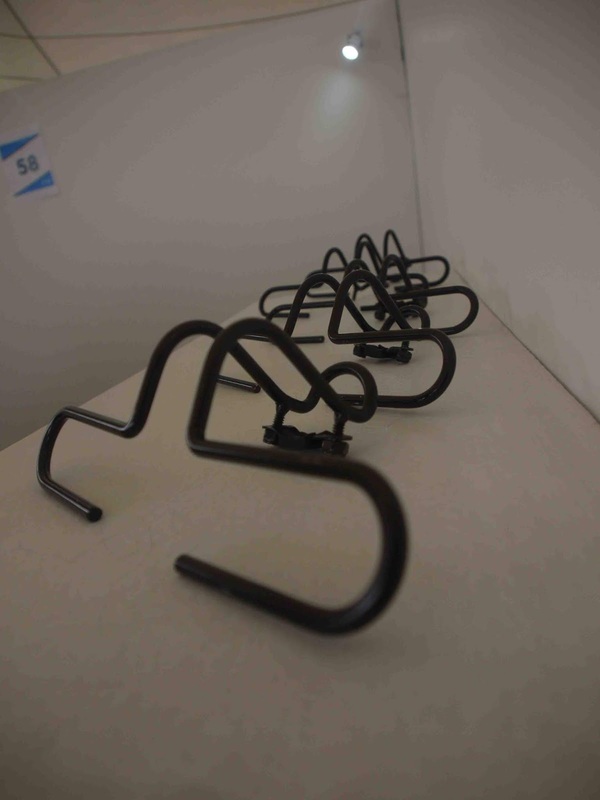 Police have arrested a criminal gang who allegedly stole hundreds of bicycles. On their way back home? Alleged bike thieves and their take. Bike theft is an epidemic here, altho a chronic one. 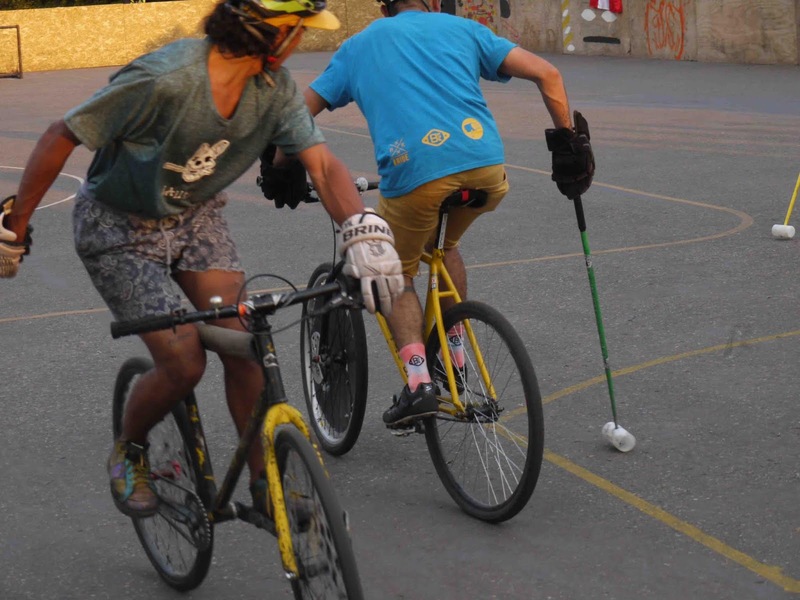 But that's not all: Recently, cyclists have been murdered during bike thefts. is often a joke here, either because the arrestees relax comfortably at home or even remove the bracelets, put them on a housepet, and go out to party or commit more crimes. Advocates of home detention point out, reasonably, that prisons are overcrowded and that prisoners often learn to be worse criminals, rather than be rehabilitated. 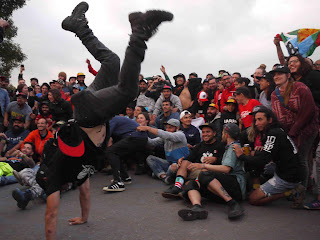 But, for a group which allegedly stole hundreds of bikes, which they might have sold for the equivalent of hundreds of thousands of dollars, does home detention serve as any deterrent at all? In contrast, stealing the transport and recreation from hundreds of people seems like a crime deserving serious punishment. Shiny bikes galore at the Feria de la Bicicleta in the Plaza de los Artesanos. Check out this year's bike products fair, going on this weekend, Sept. 29 and 30th, in the Plaza de los Artesanos near Simon Bolivar Park. Admision is free. 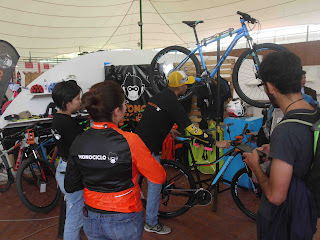 You'll find a big variety of cool, colorful bikes, packs, accesories, and other products, many of them hand-made here in Bogota, as well as these products. unconfortable and leave a sweaty patch on your back; rear saddlebags are popular, but in a big city like Bogotá you risk having someone steal your belongings behind your back each time you wait for a light to change; I like low-rider front racks, which are stable and allow you to watch your packs, but these are almost unknown in Colombia; and almost every saddlepack creates the awkward necessity of lugging a bulky bag around at your destination. 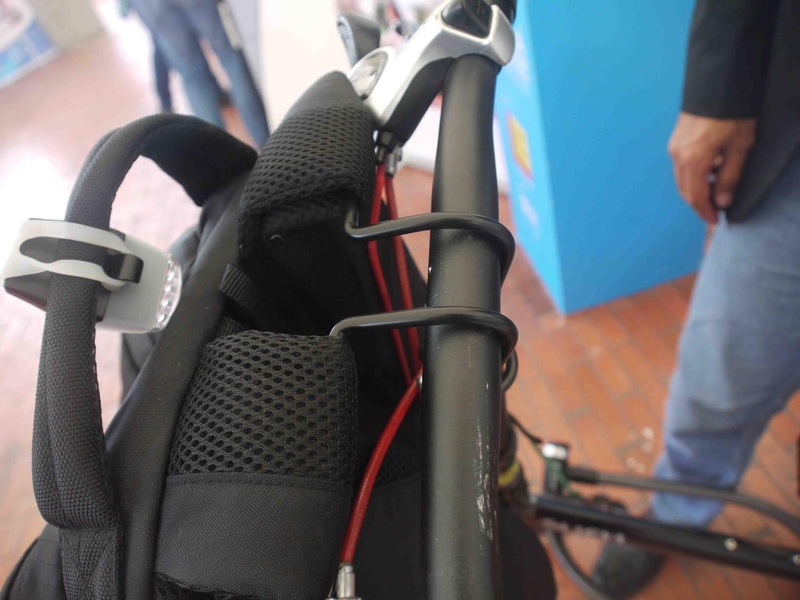 So, I was instantly impressed by MeVoyenBici's light, simple, elegant hangers, which enable you to hang your backpack securely from your handlebars, keeping it in sight, at hand and relatively protected from road splatter. 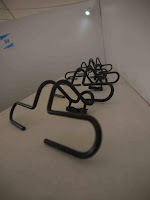 They now have hooks for folding bikes and are working on designs for other bikes, including mountain bikes. A very different solution to the pack problem also caught my eye. Bike Kontrol, whose tiny workshop is at Carrera 25 No. 24B-45 in the Samper Mendoza neighborhood, was offering these 'packs' manufactured from plastic water or gasoline containers. They are definitely waterproof! Demonstrating a Bike Kontrol rigid pack. 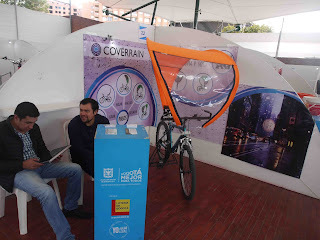 And if you want to stay warm and dry while pedaling your load, check out Coverrain's rain tarps. But how will they perform in a strong sidewind?